I'm pretty sure I've never written about any Anticon artists here on Ear To The Sound, which is both surprising and a shame because I think it's a great, forward-looking (collective-owned) label with fantastic artists including Why? and (more recently) Tobacco. Now Anticon's added 21-year-old Will Wiesenfeld to the roster and I finally get around to mentioning the label here. Wiesenfeld is an L.A. artist who records under the name Baths and while I can only guess at his reasons for choosing the moniker, to me the name invokes the restful feeling of a languid soak and that fresh feeling once you've toweled off. If that was what Wiesenfeld was going for, then he manages to set the table for the music that he creates under the alias. Balance that with the album title Cerulean (which is a range of blues in the colour spectrum) and listeners have a couple giant clues what to expect when pressing 'play' (if one still actually presses 'play' these days). From opener "Apologetic Shoulder Blades," on through album highlight "Maximalist" and straight to the end, Cerulean is a crisp, fresh collection of ambient IDM that blends warm piano loops and cold, glitchy drum snaps into a minor-key marvel. As with like-minded contemporaries Bibio and Daedelus there are some found-sound and spoken-word elements deftly incorporated in a way that doesn't detract from song structure ("Animals"). It's a great debut that suggests we'll be looking forward to Baths-time with an excitement my baby boy has for his own bath. Baths just did a pretty awesome session for the folks at Dublab, which you can check out here: "Baths' Sprout Session"
Don't forget to check out Baths' spot on the Anticon website and Myspace page. Expect a new post within 24 hours. Is it new? Is it old? Does it matter? Man oh man. I love it when music comes like a bolt out of the blue, and this one most definitely did. Earlier this morning I was opening the mail at the station and noted that one release came from Nublu Records. Considering this is the same label that has released albums by Forro In The Dark, Wax Poetic (not the magazine) and 3 Na Massa, I had to pop Ritornano Quelli Di... by Calibro 35 into my player and give it a spin. One spin led to two spins and interest led to rapture. 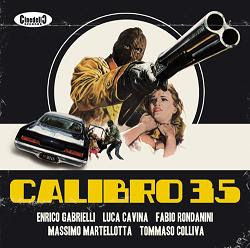 Calibro 35 is produced by Tommaso Colliva (Franz Ferdinand and Arto Lindsay among others) and features Massimo Martellotta (guitars and lapsteels), Enrico Gabrielli (keyboards and brass), Fabio Rondanini (drums) and Luca Nano Cavina (bass). The dozen tracks on Ritornano Quelli Di... are a blend of classic Italian soundtrack work (Riz Ortolani, Piero Umiliani and the great Ennio Morricone) and original tunes meant to evoke/echo the soundtracks of Italian exploitation films from the sixties and seventies. But there's also a heavy funk flavour that puts the band in the same conversation as the Budos Band, The Poets of Rhythm and the Sugarman Three as evinced by the wah-wah organ on "Calling All Units To Broccolino" and the heavy horn lines of "Talk Is Cheap." Don't even get me started on how awesome the artwork on the album and the band's posters are... these guys have the old exploitation flick / B movie look down to a T.
When Wax Poetics (the magazine) is quoted as saying "Italian soundtrack funk that sounds like Goblin recording at Stax!" how can you sleep on this album? Don't forget to check out Calibro 35's website and Myspace page.